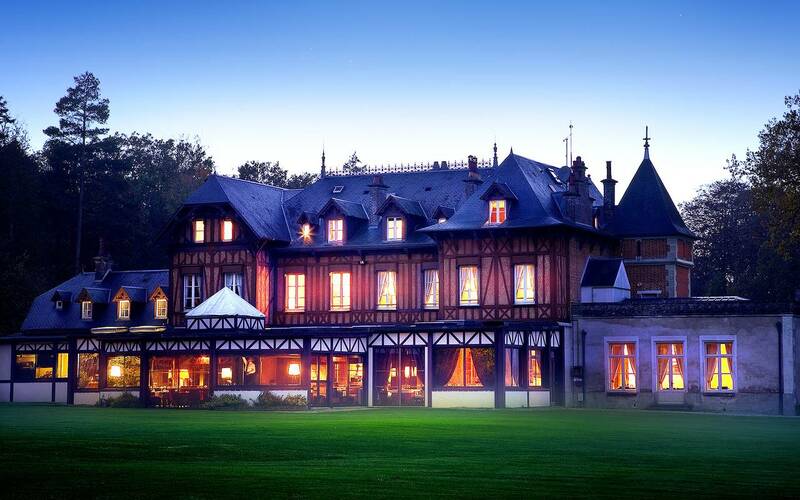 Old eighteenth century hunting lodge, located at the heart of a 80 hectare park bordered by forests, the Pavillon de Gouffern is a 4 star luxury chateau hotel located in Normandy near Caen, Alençon and Argentan. In nature, you can enjoy from the dining room or your bedroom, deer and other animals that live freely in the park. Moreover, many activities are available close to the hotel or within the park. Decorated in the style of old English manors, mixtures of leather, wood and hunting trophies gives the establishment an old charm and a unique refinement. The 20 rooms of this castle hotel in Norman are also decorated with fine materials. Leather, wood, marble mingle and give a warm and intimate atmosphere. Each room offers a view of the park and is equipped with WIFI and a flat screen TV. During your stay in Normandy, choose Le Pavillon de Gouffern to enjoy the luxury of a break out of time, probably one of the best hotels in Normandy..
During your stay in Normandy, enjoy the exceptional location of the chateau hotel "Le Pavillon de Gouffern". At the heart of the forest of Silly en Gouffern near Argentan, you can enjoy the great outdoors with the many trails, easily accessible for hiking both walking than cycling. Guests also have access during the summer, the heated outdoor pool of the hotel. Also discover Normandy and its soil! Lose yourself in the "bocage" Ornais, visit Le Haras national du Pin or enjoy an excellent cheese in cities of Camembert and Neufchatel.